This is Fett’s second appearance here in the articles section of the Fred Frank website. And for good reason. 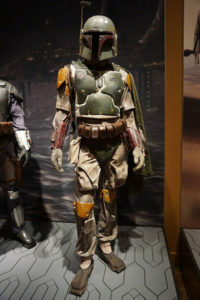 Boba Fett has long been considered the biggest badass amongst a veritable menagerie of badasses who served as bounty hunters in the Star Wars films. He’s the strong, silent type who would rather talk with his blasters than waste time with words. He’s got the armor, demeanor, weaponry, and “take no prisoners” style that lands him on this list, hands down. The Mandalorian armor alone is probably enough to strike fear into would-be fugitives. Of course, the true nerds may argue that Jango Fett should be included as well, since he’s really just a clone of Boba. But when in doubt, we like to go with the original. We also suspect that a line like “these are not the droids you’re looking for” would not have worked on Fett, the elder, so there’s an obvious superiority to your garden-variety stormtrooper at play here, clearly. Quint’s quarry (see what we did there?) wasn’t a human, but we’ll consider “Jaws” to be the biggest fugitive of all time. Quint, of course, earned his badassedness many years prior to hunting down the oversized shark. As a survivor of the 1945 sinking of the U.S.S. Indianapolis, Quint went in the water, was surrounded by hungry sharks, made it back home to tell the story, and nursed a grudge from that day forward. 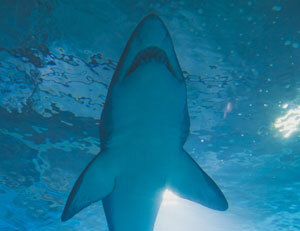 Who better, then, to hunt down a shark off the coast of New England? No one, we say. And despite admonitions that he was going to need a “bigger boat,” Quint would sooner jump in the water and wrestle Jaws to death than give up on the hunt. Sure, he may have gone down to Jaws near the end of the movie, but he also laid the groundwork for the giant swimmer to be turned into sushi at the movie’s explosive climax. Basically any character played by Harrison Ford has the potential to be a badass. Deckard just took it to the next level, wandering about in a dystopian future whilst drinking whiskey and hunting down his quarry with aplomb. Robot fighting aside, Deckard’s appearance and demeanor are enough to scare a fugitive into submission. Ryan Reynolds is just too funny to not make the list. Say what you will about the movie itself (not so good), but when you put together Reynolds’ deadpan delivery and witty retorts with Samual L. Jackson’s vociferousness, you’ve got a recipe for ultimate silliness. And Reynolds doesn’t disappoint, dropping one-liners and quips for every expletive that Jackson can crank out. For humor alone, Bryce/Reynolds have to make this list. Preternatural camouflage? Yup. Deadly accuracy with lasers? Check. Ability to survive in harsh Central American jungles for days on end? Sure thing. Super-duper scary looking without the helmet on? Got that one taken care of too. The Predator may have ultimately been defeated by Arnold Schwarzenegger at the end, but not before taking down a veritable bevy of well-trained special forces soldiers, including none other than Carl Weathers. The only real downside to the Predator is that he tended to bring back his quarry in no condition to stand trial. No matter…he still go the job done! I mean, really…who’s going to run if this guy is the one who will be tracking you down?